Elena was crestfallen. “My mommy told me I can use any color I want,” said Elena. “Well, I guess its OK at your house, but we use dog colors at my house,” commented Sara. Miss Toth was standing nearby and heard the interchange. As she approached the girls, she noticed that Elena stopped coloring and was tearful. “Elena you look like you had your feelings hurt,” she said. “Sara hurt my feelings and said I was stupid!” whined Elena. “I did not!” argued Sara. “Sara, I wonder what would make you unkind to your friend Elena? Sometimes people are unkind to someone they like, because someone else was unkind to them. Did that happen to you?” prompted Miss Toth. Sara froze. “My big sister said I was stupid because I didn’t know the name of my street. Now I know it so I’m not stupid anymore.” Miss Toth talked with Sara about her sister’s unkind words and her hurt feelings, saying “I’m so sorry your sister hurt your feelings, but it won’t help you feel better to hurt someone else. You are a very smart girl who can be proud of what you know and what you learn.” Miss Toth’s empathy helped Sara understand why she was unkind to Elena, and find a way to repair the situation. The Lesson: What looks like bad behavior often is an expression of some deeper feeling. Miss Toth knew Sara as a kind girl and used that knowledge to help Sara know herself better. In an attempt to ease her own hurt, Sara had made someone else feel as she felt—little and stupid. We want to make things right when a child is unkind by admonishing or reprimanding, but those responses only result in greater hurt. By being kind in the face of unkindness, Miss Toth helped Sara know and express her feelings, resulting in a step toward mastery. When we find meaning in behavior, the behavior makes sense. With that understanding we can figure out the best solution to promote learning and progressive development. For example, we can help Sara find relief by using words to express her feelings, and then help her make things right with Elena. In her comments to Elena, Sara took the position of the seemingly stronger person, her sister, and then repeated her sister’s behavior. This is a typical, human response for children and adults alike. Miss Toth knew this dynamic with young children and was able to help Sara feel understood. Then Sara could manage her feelings and be a kind girl again. It is so helpful to Sara that she is learning about her emotional life at a young age and in a safe place. 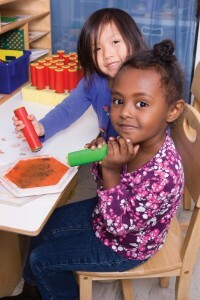 When children cannot find the right words, they tell us their thoughts and feelings through their behavior. Behavior almost always has meaning. Inappropriate behavior can mean that children are struggling with feelings: sad, mad, jealous, worried or scared. Children and adults can work together to figure out the meaning of behavior. Children who are not behaving appropriately might be scared or worried about something. Children who seem angry might really be scared, worried or sad about something. Children who behave inappropriately to get adult attention might need attention. Children calm down faster and behave better when they are helped by calm, understanding, loving adults. Think about times in your life when you were upset and needed help from someone; what helped you?